I have been asked, 'What can we do?' 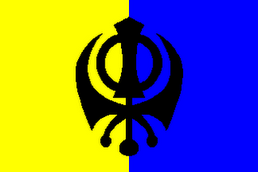 I have contacted Dal Khalsa and am awaiting a reply from them. I have also written in IHRO, but it has not been sent out to the membership yet. You know, moderators. Karnal, Haryana (KP) – It has been over a week and Bibi Parveen Kaur is still lodged behind the bars. Several Panthic and Human Rights Organizations have come out to support her, but when and how she will be released remains a mystery to be solved. Ever since her arrest, the Bibi has had to face severe torture and access to her lawyer and family has also been somewhat limited. Who Bibi Parveen Kaur is and on what grounds was she arrested? She is an innocent Sikh woman in her youth and comes from a middle class family. Quite oddly, while many perceive this simply as the cause of her harassment, it is not entirely true. The story of Parveen Kaur is not merely few weeks old, it is a legacy. Two decades ago, her parents and relatives were targeted by the most ruthless and corrupt police force in the world, and now she and the rest of her family are under the authorities’ crosshairs. The police forces of Punjab and Haryana Police are notoriously known on record for eliminating thousands of innocent Sikh youths using conjured up charges and staged encounters. 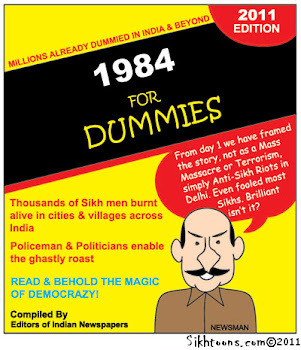 Now, these dishonest forces are targeting the next generation of Sikhs, and using similar age-old Indian police tactics. Bibi Parveen Kaur was arrested on falsified charges of taking part in the supposed assassination attempt on Gurmeet Ram Rahim last month. Shortly after the blasts took place, the police named several suspects. Despite failing to provide credible evidence to support the arrests, the Haryana and Punjab Police have continued to use this as an opportunity to harass innocent Sikhs. According to revelations made by police officials, Bibi Parveen Kaur was supposed to be used as a human bomb and she allegedly kept the 'explosives' in her custody for at least two weeks. While Parveen had refused to partake in the actual implementation of the action, the Police alleged that she remained faithful to the cause. 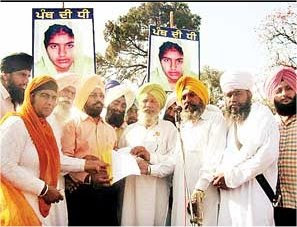 Sikh organizations, however, rejected such allegations against Parveen Kaur, and demanded her release from police custody. The Shiromani Akali Dal (A), Mata Gujri Sahara Trust, and Dal Khalsa leadership have shown particular interest in the case and have organized rallies in large scale to express their dissent with the Police. They state Parveen Kaur is completely innocent, and is being unfairly targeted by the Police due to her family’s background. Family, friends, and neighbors have also totally rejected claims by the Police and state that Parveen has been falsely implicated in this case by the police to fulfill their self-interests. Parveen Kaur, who comes from a Muslim family, had converted to the Sikh religion years ago during the turbulent 1980s. As details of her family’s background emerge, the actual motives of the Haryana and Punjab Police behind her arrest become clearer. Parveen’s family has long suffered under the persecution of the Police forces of both states. Parveen’s father, Mohammed Sadiqque, was killed by the Punjab Police during the freedom uprising of the last two decades. His only fault was that he was married to the sister of Bashir Mohammed, an ex-Police officer who quit his Government job after observing human rights abuses at the hands of the Punjab Police. Bashir Mohammed was set up as a spy against the Babbar Khalsa organization by DSP Sukhdevn Chahal and was sent to provide confidential news from the training camps. There, not only did he realize the reality of the Indian Government and Punjab Police, the jeevan of Babbar Khalsa Singhs deeply influenced Bashir Mohammed that he took up the Sikh baptism and became Lachman Singh. Bhai Lachman Singh soon stopped proving reports to DSP Chahal which hurt many of his projects badly. In addition, he provided valuable information that helped safeguard many Sikh families. Eventually he crossed the border and settled in Calcutta with his pregnant wife Bibi Rani Kaur. The DSP was stunned by the conversion of Bashir Mohammed and saught revenge at all costs. It was during 1993, when operatives of the Punjab Police led by DSP Sukhdev Chahal found out the whereabouts of Bhai Lachman Singh and came to Calcutta to assassinate them. Late at night on May 17th, the cowardice police officers entered the house of Bhai Lachman Singh and gunned him and his wife down while they were asleep. The unborn child of Bhai Lachman Singh also became the target of police brutality. There was huge uproar in the State of West Bengal and surrounding areas after the murder of Lachman Singh and his wife. A case was filed by Bhai Lachman Singh’s mother-in-law (mother of Bibi Parveen Kaur) against the Punjab Police. The Supreme Court of India found very credible evidence against five Punjab Police Officers, all of them who were later sentenced. SP Operations SK Sinh (Bathinda), Sukhdev Chahal (Bathinda), Hawaldar Ramdayal, Sukhjiwan and Darshan Sipahi were found guilty of murder, abduction and forgery of evidence. After collecting evidence from the State of West Bengal, the Supreme Court issued orders to summon the accused immediately so that they could not forge evidence any further. The evidence collected by the Court suggested that the Police officers involved in this case were wearing Police uniforms, were armed with Sten assault rifles, held walkie talkies, and spoke the Punjabi language. After killing the couple, they took the bodies in two blue Maruti cars. No report of the incident was filed with the local Police. This past week, Bibi Parveen Kaur was presented to a local court after being arrested and a remand was issued to the Police. Ever since being in police custody, Bibi Parveen has been brutally tortured for her one and only crime of being related to Bhai Lachman Singh. The Police officials who hold personal rivalry against Bhai Lachman Singh are using Parveen’s arrest as revenge against her family. The Sikh organzations are demanding a higher level inquiry into this case by national and international human rights organizations as well as by an independent CBI counsel directly under the supervision of the honorable Chief Justice of the Supreme Court of India. Bibi Sohanjeet Kaur alleged that the arrest of Parveen Kaur is no different from hundreds of arrests that were made of innocent Sikhs during the 80’s and 90’s. Bibi Sohanjeet Kaur, who was widowed during the years of State organized oppression, is a key witness to many such arrests. She now runs the Mata Gujri Charitable Trust which provides housing to wards of Shaheeds and Bibi Parveen Kaur is one of them. Bibi Sohanjeet Kaur held that she was arrested by the Haryana Police without any warrant. According to her statements to the press, the policemen first took away Bibi Parveen Kaur for some investigations at the Patiala Sadar Police Station. Later it was found that the police presented her in the court and received her remand. Surprisingly not only the Sikh organizations have come up to support Bibi Parveen Kaur, she has won support of many non-Sikh organizations as well. The CPI ML Liberation also lashed out on the Haryana and the Punjab Police for arresting Bibi Parveen Kaur under false allegations. Rajvinder Singh Rana held that the arguments presented by the police were baseless and that it was clear that the police was preplanned her arrest. On behalf of his organization, he demanded the release of the Bibi and held that the Government should punish the police officials who arrested her without first registering the case. The SGPC President Avtar Makkar has also alleged his support for Bibi Parveen Kaur. At a meeting held at Fatehgarh Sahib, Avtar Makkar and several other SGPC members announced to provide support to the Bibi. He has however not raised this concern with the State Government, for which he remains most loyal to. The type of support Bibi Parveen Kaur needs cannot be provided merely by using fancy words, if Avtar Makkar really wishes her well, he should use the resources of the SGPC and his self influence to provide her with good lawyers and proper media coverage. However, it will be interesting to note if Avtar Makkar does decide to take any part in the current issue as the counterpart of Makkar’s title-holder – Parkash Badal, Rajinder Bhandri has already released statements critical to the release of Bibi Parveen Kaur.